Selecting the best rotary hammer for your next remodeling or construction job is critical, but making the right choice can be complicated. Whether it’s new construction or maintenance, many jobs require drilling holes in concrete for precision jobs like anchoring. The type of rotary hammer, the bit/tool interface systems and the drill bit types, type of the job and availability of electric power are key factors when selecting the best rotary hammer for you and your crews. 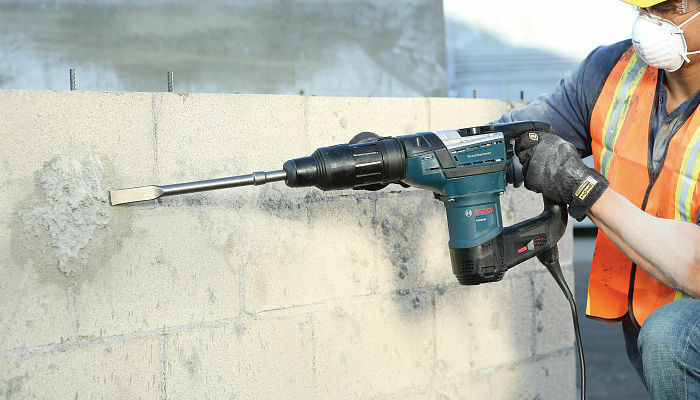 Rotary hammer: A drill that uses rotation and a hammering action that breaks up the concrete as the bit rotates. Rotary hammers are designed for day-in/day-out use. Before selecting the best rotary hammer for drilling into concrete and/or masonry, determine the diameter of the holes you need to drill. The diameter of the holes will dictate the type of rotary hammer and the bit/tool interface system you will need to select. Every tool has its own optimal drilling range. By identifying the best rotary hammer drilling tools with optimal ranges correlating with the dimensions of the holes required, you can make a much better decision on which size tool you will require to get the job done. By selecting the best rotary hammer designed to drill fast, precise holes, efficient performance will almost be guaranteed. Though operating the hammer in rotary drilling mode within the ranges listed below will offer the best results, each hammer also includes the flexibility to drill larger holes as well. Even though intermittent rotary drilling at full bore capacity is possible, it’s always better to opt for the next larger rotary hammer if any drilling series requires larger holes. Like any other tool or machinery, constantly pushing a rotary hammer to its extremes will eventually lead to the tool’s failure. It’s also important to select a tool with the right functions. 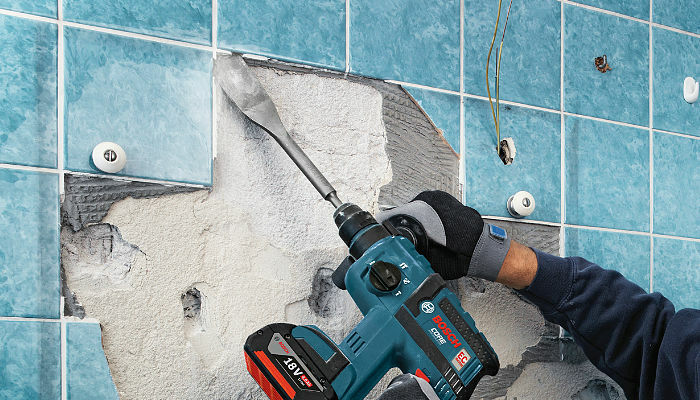 Bosch rotary hammers (SDS-plus) offer three modes of operation: hammer drilling, drilling only and chiseling only. Larger combination hammers typically offer two modes: hammer drilling and chiseling only. In addition, each rotary hammer incorporates the flexibility to drill larger holes as well. 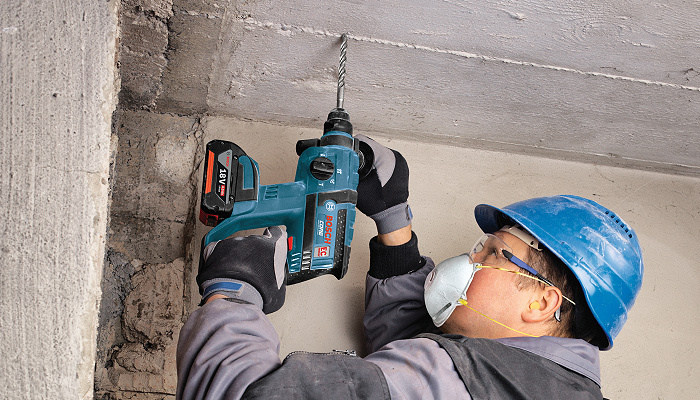 Bosch SDS-plus hammers can handle carbide-tipped core bits from 2-1/2" up to 3-1/2", and SDS-max hammers can handle carbide-tipped core bits from three inches up to 6" and thru-hole bits up to 3-1/8". The exact size core and thru-hole bits are dependent on the hammer size. Though occasional rotary drilling at full capacity is possible, you're always better off opting for the next larger hammer for continuous larger hole drilling. Like any other tool, constantly pushing a hammer to its extremes will eventually lead to failure. Investing in the next larger hammer upfront will pay off in the long run. By selecting the best rotary hammer designed to drill the holes that are needed, users can guarantee faster and more efficient performance. One critical point to keep in mind when using a hammer for rotary drilling is to let the tool do the work; applying too much pressure on these tools can actually decrease performance. The Best Rotary Hammer Requires The Best Bits. When it comes to rotary hammer carbide bits for rotary drilling, it’s best to think of hammers as a system. With all the improvements in power tools over the past few years, the carbide bit technology has helped deliver even more efficiency. Optimized flute designs help remove dust quicker, extending the speed as well as the life of the drill. Newer Full Head Carbide Bits provides added durability with up to four times the life of standard bits. Some specialty bits include dedicated rebar cutters to “stop bits" that control depth to avoid post tension cables. Bosch also recently added further dust control with the Speed Clean bits that remove dust directly from the hole while drilling, saving time and helping meet the new OSHA dust control requirements. Rotary hammer bits have been upgraded over the years to keep pace with the increased hammer impact energy. Bosch rotary hammers and accessories, such as bits and spades, have been maximized with the industry standard SDS system provides the full benefit of optimal energy transfer to the work surface. Matching up the right tool and accessory system leads to faster and more efficient drilling and ensures you get the value out of your tools instead of overheating them, leading to costly down time and repairs. Making the right decision on the best rotary hammer and associated concrete and masonry bits makes your work easier, gets your work done faster and ultimately, your tools will last longer. 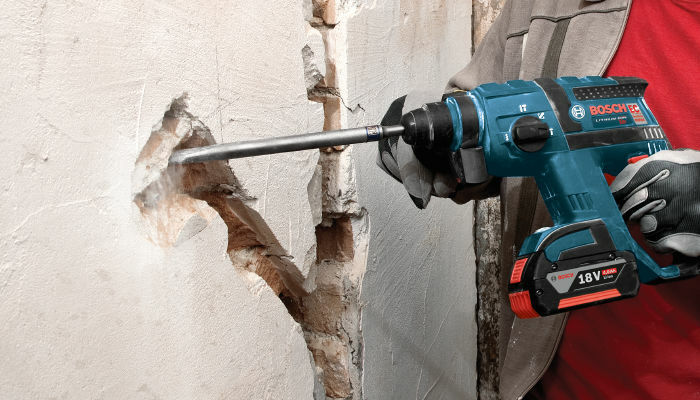 For more on Bosch rotary hammers, click here. For more on Bosch rotary hammer bits, click here. In considering different brands of hammers for rotary drilling, take into consideration the overall durability and features of each tool line. Bosch makes some of the toughest tools on the market for rotary drilling, with internal gearing and motors designed to take the abuse of high temperatures and extreme applications. 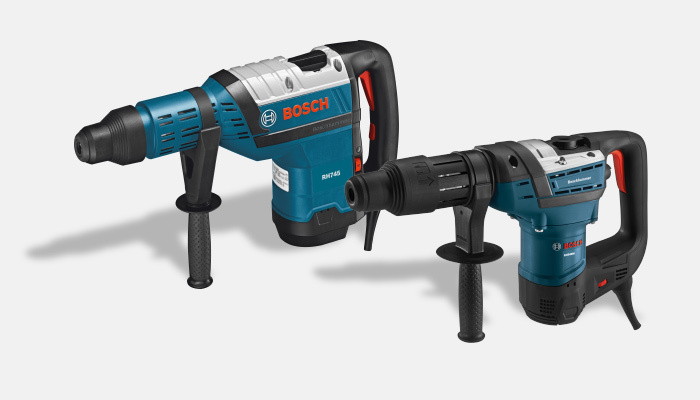 Bosch offers a full line of SDS-plus rotary, SDS-max and spline rotary/combination hammers. And as the world’s number one hammer manufacturer, Bosch has built a reputation for offering tools designed to perform and last. By understanding all of the different hammer options available, users can see why choosing the right rotary or combination hammer can make a big impact on the bottom line.